If you would like to try self-supported bike touring, you will need a bike. Your choice of bike depends on the type of touring you plan to do, and where you intend to ride. For example, if you are eating in restaurants and staying in motels, your choice of bike may be different than the person who is camping. In the 1970’s, finding a touring bike set up for racks and panniers was difficult. 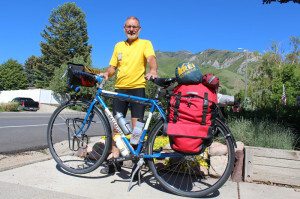 There were some high end bikes at that time for touring, but despite the bike boom of the 70’s, bike travel was not common until BikeCentennial (now Adventure Cycling Association) had their inaugural cross country trips in 1976. By the late 1980’s and until about 10 years ago touring bikes disappeared from bike shops save for the occasional Trek 520, one of the few made-for-touring stock bikes one could buy. Custom touring bikes could be obtained for a price. Within the past 10 years there has been a proliferation of bikes made for travel, set up to handle front and rear panniers and with enough features to get you from point A to B with whatever you want to carry. However most bike shops still do not have touring bikes on the showroom floor. You can get bikes in steel, the most common frame material, or you may choose aluminum or titanium. Most bike travelers that are on trips for more than a year buy steel bikes for the possibility of needing the bike welded, especially braze-ons for the racks. Salsa, Surly, Jamis, Novara (REI) and Raleigh are some of the stock bikes one can purchase as complete bikes off the rack. Co-Motion, Bruce Gordon, Waterford and Gunnar are some of the higher end bikes customized to meet your preferences. Currently the Surly Long Haul Trucker seems to be the most popular touring bike in my travels. If you want a European model, then consider Thorn from England, Tout Terrain from Germany or Santos from the Netherlands. Apparently there is enough demand for the increased selection of travel bikes. Other companies that make touring bikes include Pereira and Breadwinner (by former Salt Lake City resident Tony Pereira), Bianchi, Trek, Seven, Kona, Fuji, and Redline among many others. Your first decision regarding the purchase of a touring bike is an honest assessment of what type of touring you will be doing. Are you going out for a few long weekend tours or riding around the world? Do you envision yourself using the bike for the next decade on repeated tours or is it something you may do once? Will you be mostly touring on-road or off-road? Will you be touring on single track and rocky jeep roads or relatively smooth gravel roads and packed-limestone bike trails? Most road style touring bikes with 700C wheels will easily ride smooth packed gravel roads nearly as well as the pavement they are meant for. There should be room to mount 700 X 40 C tires on it with fenders. As the roads get rougher or if you are spending a lot of time on gravel, you may want to consider a bike capable of accommodating wider tires. If your plans are for a very long tour or for multiple shorter tours the cost of the bike may be less of a factor over the long run. You should find an assortment of bikes for your needs. In general, if you can put racks on the bike, you can tour on it. If you can’t put racks on your bike one may consider pulling a trailer. Buying a complete touring bike should be simple. You obvious will want the bike to fit well. If you are like me, spending 6 hours a day on the bike 3.5 out of 4 days during a tour makes comfort high on the list of needs. A touring bike should have a stable geometry with plenty of room for racks and fenders. One can measure the quality of a touring bike by saying the bike rides better with weight. However looking at the specifications of many “touring” bikes, one needs to pay attention to gearing. I have looked at multiple touring bike reviews with many bikes spec’d with gearing not low enough for touring in mountainous terrain such as here in the West. Most suggestions for low gears on a touring bike would be in the low 20’s. How to calculate this is simple. Take the number of teeth from the smallest chainring in the front (perhaps 30) and divide this by the number of teeth on the rear cassette (perhaps 32). In this case, this equals 0.9. Then multiply this number by the wheel size. (a 700C wheel is approximately 27 “). The gear in inches in this scenario is just over 24, a reasonable setup though a smaller 26-tooth small chainring may be better. On the flip side, the high gear doesn’t need to be higher than the 90’s, yet I see a lot of “touring” bikes spec’d with 120-inch high gears. You won’t use that high of a gear unless you are racing your touring bike. Julie and I have low gears of 22, high gears in the 92+ range and we each have plenty of gears in between suitable for any road. Wheels will be your next consideration. For travel to Asia or Central and South America, 26” wheels would be best as rims and tires in other sizes will be difficult to find if you are on an extended tour. Some bikes in smaller sizes will come with stock 26” wheels such as the smaller sizes of the Long Haul Trucker. I’m not going to get into the subtle differences in wheel size, for that becomes a personal issue. Do look for a strong wheel. The standard 700C wheels for touring are built with 32-36 spokes in a 3-cross lacing pattern. Forget aero style spokes. The spokes used in a recent story, the writer rode 54,000 Km (10,000 on dirt) with only one broken DT Swiss comp 1.8/2 spoke. Mount your wheels with quality durable tires. Included in decisions about wheels will be hub selection. One can choose between internal geared hubs or external cassettes. In addition do you want traditional 130 mm hub spacing for your road-style touring bike or 135 mm mountain bike hub spacing? If you use disc brakes, your bike will have 135 mm. If you decide to use an internal hub, most of what I have read in on-line forums has suggested the Rohloff hub, a very pricey hub that will need the wider spacing. I have hosted 3 bicycle travelers that have used the Rohloff hub, two being German, the home of Rohloff. I bring up the issue of hub spacing because of an experience Julie and I had during our Canadian Rockies tour. Julie had a spoke pull through the rim. I was able to true up the wheel but with over 900 miles left in the tour, we made the decision to replace her rim or complete wheel. We stopped in 4 bike shops in Fernie, British Columbia. Of the 4 bike shops, only one had a 700C wheel with 130 mm spacing. That shop took the wheel off of the only road bike in stock. We could have waited for a replacement rim to be shipped in but that may have been 2-3 day delay waiting for the rim and then having the wheel built. Wheel problems like that are rare. This was our first wheel problem save for a loose spoke in 17,000 miles of touring between the two of us. Making a choice of wheels due to a rare possibility probably should not be an overwhelming part of your wheel choice but may be a consideration. One mountain bike technology to trickle down to your touring bike is disc-brakes. Your first consideration is to ask yourself if you need the stopping power of a disc? The answer will be a yes for descents on mountain passes especially in inclement weather. Perhaps even on short steep hills the discs would be nice to have. However outside of those scenarios my answer to disc brakes will be an unwavering maybe. Parallel pull (V-brakes) will stop you if set up properly and you have fresh pads. Cantilevers will slow you down but do not seem to have the stopping power I would like. Discs have one of those “Catch-22” issues. The pads last a long time so being comfortable or good at changing pads becomes a challenge, as you won’t need to change them very often. Another problem with disc brakes is the squeal factor, so much so that the noise is highly annoying. It took nearly 3,000 miles on my commuter bike for my front pads to break-in, if that is the correct term, for the squeal to be eliminated. The squeal will return sometimes with rain. Theoretically the squeal can occur with long descents as the rotor heats up. The last bit of advice is with regards to boxing your bike for travel. You may want to consider removing the rotors to reduce the chance of a deformity occurring. Other criticisms of discs are cost and weight. Cost is certainly a rational issue. Like most products, if you use it a lot, the cost concerns diminish over time especially if the product meets a high level of performance. The little bit of extra weight on a touring bike should not be of consequence in my opinion. How the housing for the discs is mounted may be a concern. On my commuter/off-road touring bike I would not be able to put water-bottle mount under the down tube nor have my preferred kickstand installed due to interference with how the housing mounts to run cable to the rear disc brake. These are annoying issues, but would not ruin a bike for touring. Perhaps working closely with the builder of a custom-built bike would alleviate these issues. Any issues with rear rack mounting with a disc seems to be resolved if the disc is on the chainstay. With the front disc, I had to use spacers for my Tubus front rack. Your final choices on your touring bike are personal choices regarding handlebars (flat or drop bars), pedals (clips vs. clipless) and how you carry your stuff (panniers, bikepacking bags or trailers). My experience would say that most American bike tourers prefer drop style handlebars. On the other hand, nearly all of my around-the-world bike-touring guests have used flat bars on a mountain bike. If you buy a touring bike with drop-style handlebars, the bike most likely will be spec’d with a road triple vs. a mountain bike triple crankset. From what I have read, fewer manufacturers are making shifter/brake levers for triples so bar-end shifters are being put on bikes with drop bars. Bar-end shifters are not a bad option as there is less chance of the shifter housing interfering with a front handlebar bag. If you are bike-packing, flat bars will be required. I do not have enough personal experience to comment on the following thoughts. Do you want a Gates belt drive? Co-motion makes a bike with a Rohloff hub and a Gates belt drive. How about 650B (27.5) wheels? Through-axles, first seen on downhill mountain bikes, are spec’d on one version of a Salsa Vaya touring bike. And lastly, would a recumbent or a folding bike fit your needs? So what would I buy for my next touring bike? First I do not see myself traveling (extensively) in developing countries at this time. However, I recently bought a custom-built commuter bike (26” wheels) that is also good for off-road loaded touring on dirt roads and trails up to the point of needing a shock. It has flat bars, though I almost put drop bars on it. The bike does have disc brakes but I wished I had opted for rim brake mounts as an add-on option. The frame is spec’d for disc brakes only. 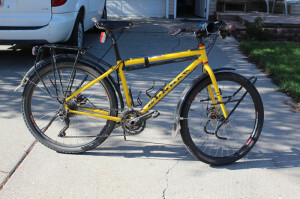 It is a Gunnar RockTour that I had modified with a lowered bottom bracket and top tube. The lowered bottom bracket gives me, I believe, a really stable ride. The bike handles wonderfully. The lowered top-tube allows me to swing my leg over the top tube easier. At my age, I’m having some issues with muscle and joint stiffness that standover clearance on my bikes is becoming a larger consideration. If I were to replace my current road-touring bike (also by Waterford), I would want 135mm spacing for an option for a Rolhoff hub if I could obtain one cheaply (unlikely). I would most likely use a traditional cassette and derailleur set-up. I would like to have the capability of either discs or rim brakes as options on the bike but I would use disc brakes unless the bike was going to be used extensively for touring in remote developing nations. I was concerned about the ride quality of a bike with disc brakes due to the beefier forks. Richard Schwinn of Waterford bikes commented to me that disc brakes require “forks to be super beefy and hence heavier and stiffer compared to loaded touring forks”. The folks at Millcreek Bicycles, who sell Waterford/Gunnar bikes, said that the effect of discs with ride quality is minimal. My current road bike has a very nice ride quality to it that I do not want to compromise. I would use drop bars with bar-end shifters unless I could bury the derailleur housing under the handlebar tape. I would have a kick-stand plate installed.